This is a far from comprehensive guide to what I do. Here are some of the things that I do, if it's not listed on here, please contact me, if I can't undertake the job I usually know someone who can. THIS PAGE IS BEING UPDATED AND AS SUCH IS A "WORK IN PROGRESS" I WILL ADD MORE CONTENT AS THE PICTURE OPPORTUNITIES ARISE AND TIME ALLOW, I HOPE YOU ENJOY READING IT. I keep a good stock of all the metric Helicoil thread inserts and have a surprising amount of most imperial ones, including Whitworth, Cycle, UNF and UNC. I also have quite a few oddities such as M20x1mm, M7 left hand as used on quite a few gear linkage rods. If a thread has been stripped previously and has been tapped to the next size (often seen on cam caps on Japanese bikes) I can clear out the thread and machine up an insert that can return it to it's original size. From a small Japanese crank, through to large cranks such as Harley Davidsons, I can even do the new interference fit type Harley Cranks (unfortunately they don't do any crank pins for these yet, but I can usually make one good one from from one that maybe has a damaged shaft) I can also recondition your con rod and supply superior quality bearings. I also do the new one piece style bearings for British singles, replacing the original side by side bearings that were standard fitment. 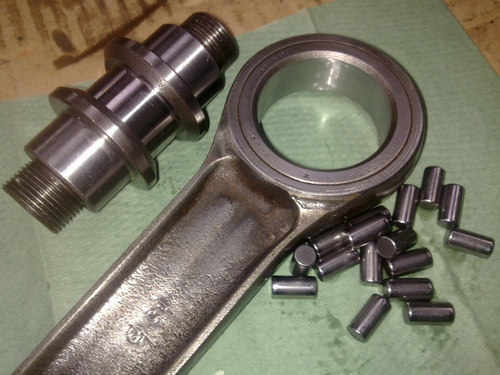 Using these bearings, it reduces the possibility of the bearings from slewing on the crank pin, thus increasing its longivety also it increases the bearing surface are as there does not need to be as a big a clearance between them to allow for expansion. 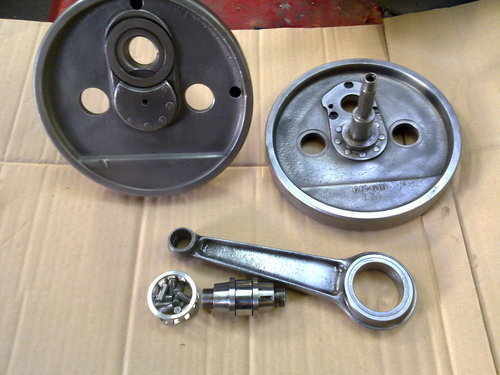 I have supplied and fitted these bearings for some years now and so far have only had good reports even on high mileage and hard used machines. 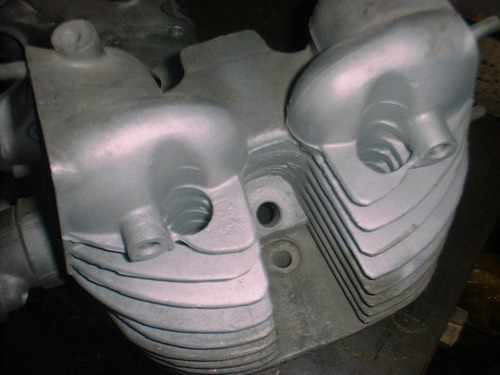 All types of engine rebuilds undertaken, from vintage to modern multi cylinder engines to standard finish or to your specifications. 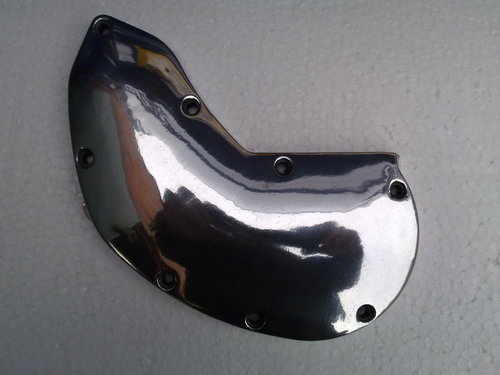 All types of finishes on the engine components can be applied, such as zinc plating, golden cadmium, phosphating (chemically blacked) powder coating stove enamelling, stainless fasteners or chrome, the choice is yours. 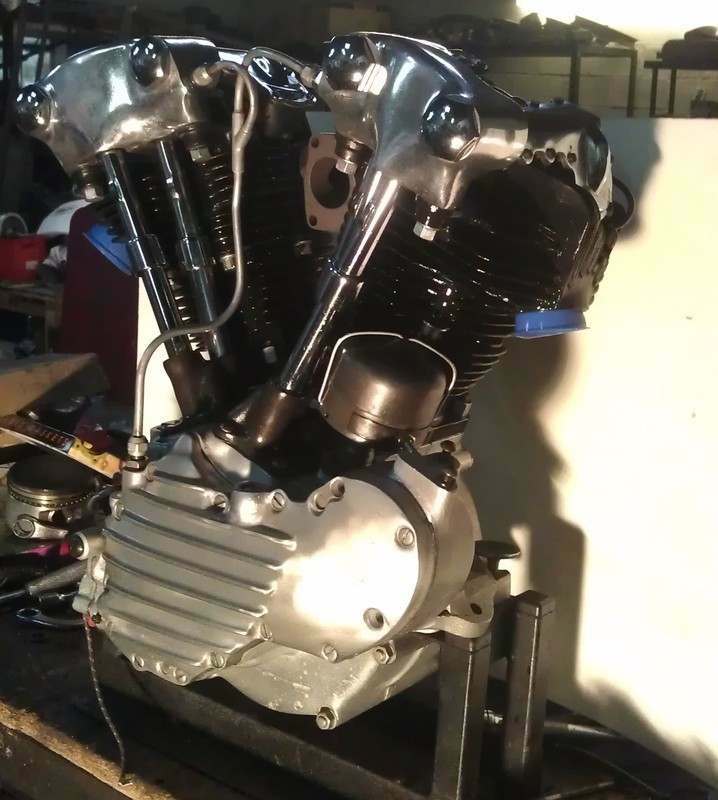 Using my Van Norman 944 or my 944 minibar conversion I can rebore your cylinders to size and then finish them with my Delapena hone to produce the correct cross hatched surface this can usually be done while you wait if you arrange it with me first. I can supply the pistons if neccessary. 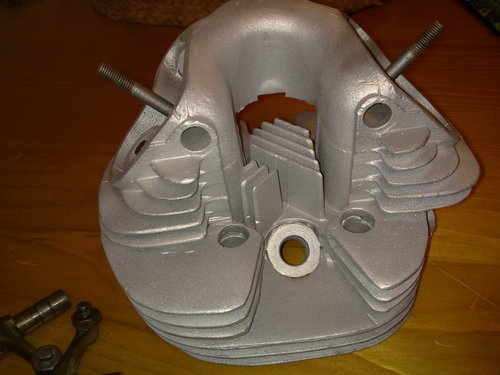 There is a wide variation in the quality of aftermarket pistons (especially on British bikes) that I would prefer you to ring me prior to purchasing a piston for me to do a rebore so that I can advise you as to the best quality ones to fit. Multi cylinders are not a problem. No need to dismantle to assess bore condition! This is useful for a very quick assessment of any job as long as the camera can be placed within the area of the components needing checking, thus saving time on the diagnosis and consequently this saving is passed on to you. the camera itself is approximately 9mm in diameter, so it can pass even into a 10mm spark plug hole, it's resolution is that good that you can even read the stamping on the tops of the pistons! The images can be uploaded onto a laptop and emailed to the customer. It comes with a mirror to enable it to look upwards to the valve pocket, there is also a recovery magnet to go on the end to use if you drop anything where you shouldn't!!! This is one of the new types that you can record video and still images allowing me to email the information directly to you to illustrate any problems that I come across. 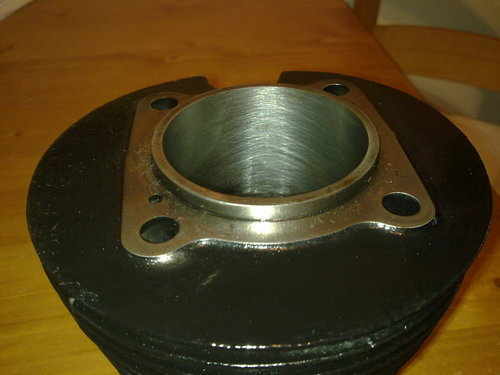 Used in conjunction with the camera above, I can quickly test the compressions on your cylinders and give a full assessment of your engines top end and advise you on the best option for repair. It works with 10mm, 12mm, 14mm and 18mm plug holes.I also use a leak down tester which pressurizes the cylinder with a controlled amount of compressed air and the speed it leaks out gives me a reasonable indication of the condition of the piston rings and the valve sealing. 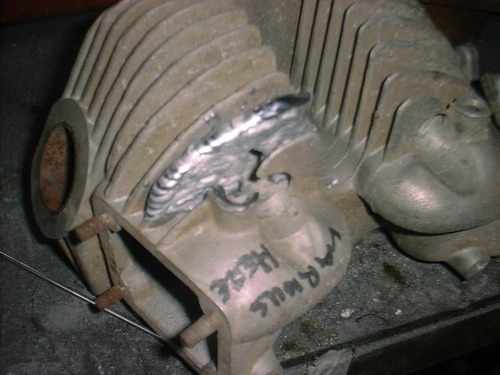 If there is a fault on any of the components I can pinpoint it by listening and feeling where the air is escaping to, for instance, if the air is coming from the crankcase breather the rings are at fault, if the air is escaping from the exhaust then the exhaust valve is at fault and likewise if it comes from the carburettor then the inlet valve is at fault. I can ream most bushes such as main bearing bushes, small end and camshaft bushes, then I can finish them with my Sunnen honing machine. I also use the Sunnen honing machine to size the hardened races on big end bearings. 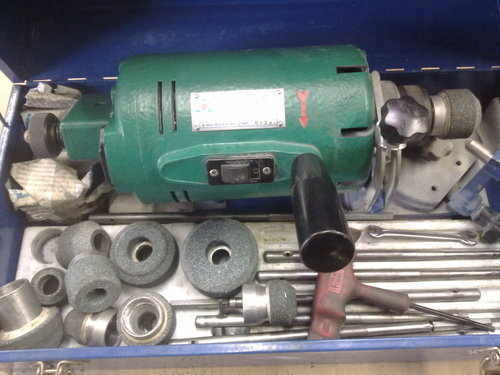 The honing machine consist of a powered mandrel that contains abrasive stones, as it revolves I can adjust the amount that the stones protrude and remove more metal, as well as removing the metal, the cross hatched finish it leaves retains the oil better and lets the bushing "bed in" in a better way than with just reaming them out. 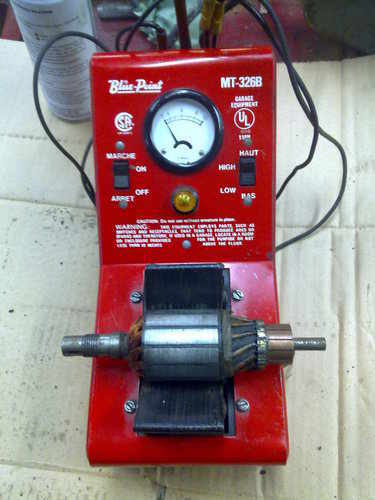 Once upon a time, armature testers were a common feature in every garage, but as components became cheaper they were usually phased out and resigned to the scrapheap, so consequently they are quite expensive and hard and to come by now, indeed, this particular one I use came all the way from Canada! They are useful for testing the armature for electrical shorts and breakdowns in the insulation. The dynamo and starter motor are quite misunderstood by most people, and are sometimes discarded for a new component when in reality there is very little up with them, I find that most of the dynamo armatures I test that are suspected of being faulty are in fact in serviceable condition, in reality most of them only need new carbon brushes or a quick skim on the commutator and undercutting the mica insulation. A ten minute test will possibly save you up to £100 on a new armature! 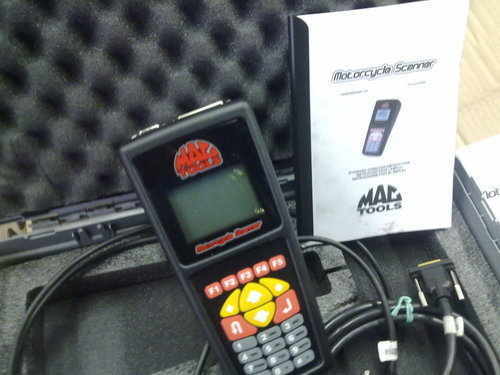 I can rewire most motorcycles from scratch or find any faults using some quite specialised testers such as the "Power Probe" which tells me the polarity of any wire (either positive or negative) Using this I can also power up circuits independently to see if the wiring or the component itself is at fault. I also have the Power Probe Short Finder, which sends a radio signal down the circuit to be tested, the signal is picked up by a receiver which gives an audio tone which speeds up as I reach the short or break in the wire. This is especially useful if you don't want to undo the insulation along all the wires, for instance if there is a break in the wires around the headstock area. 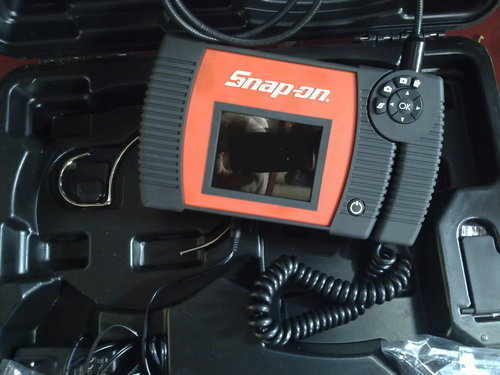 For modern engine management systems or fuel injection systems I use this type of equipment, this enables me to quickly read trouble codes, monitor engine sensors, test coils and do live readings to see what happens to a component prior to a fault showing up, especially useful if the fault is intermittent. 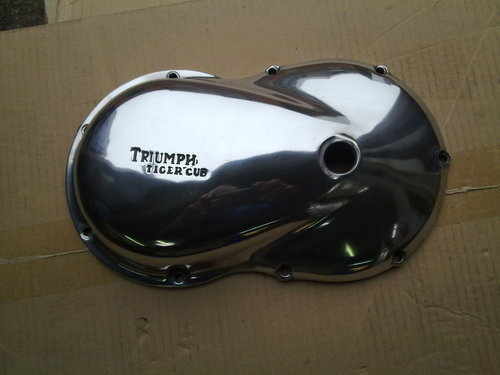 I can use this on most modern motorcycles, from Harleys to Yamahas It is equipped with most of the leads to cover nearly all models and is updateable to cover newer systems and new models. 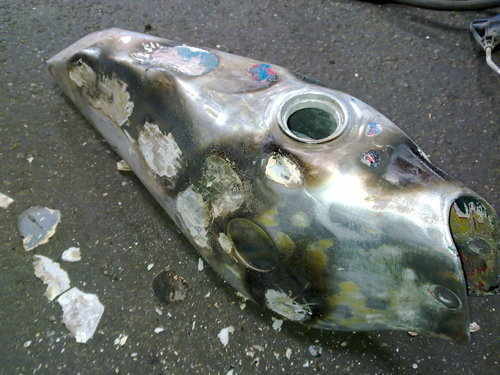 This is a good example of the types of petrol tank repairs I can undertake. I try to remove the dents through the filler cap if possible, then if this fails I remove the bottom, either as a whole or just a small section of it. I have recently acquired a Paintless dent repair kit (PDR) to make it easier to get small localised dents from the thinner material that is used on modern petrol tanks, this kit is basically a rod with an adjustable end to vary it's angle, the tip of which has various sized and shaped ends to help try to pry out the dents from the inside of the tank, this is also useful on car bodywork to get in behind panels to remove small "shopping trolley" dents. 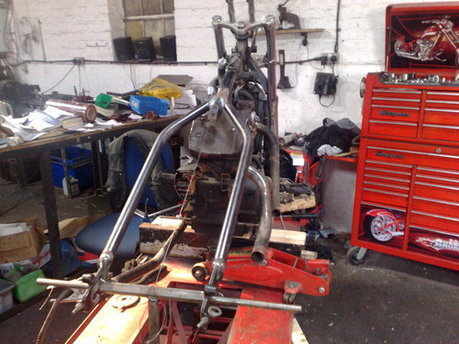 I used to run as part of one of my previous jobs a fork rechroming business so I am completely familiar with rebuilding front forks, I can even remove the bottom castings on most types of "upside down" forks. 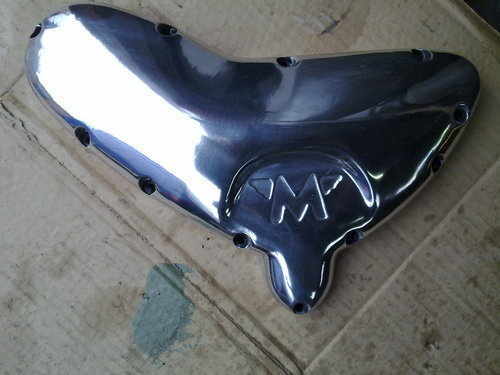 I do not undertake the rechroming any more, however I do still advise on the best place to get the rechroming done. I can also avise on the best methods of renovating worn components in the forks other than just the fork tubes. I can also undertake the rebushing of girder forks on vintage motorcycles, including the BSA types with spigots on the fork links which can cause problems when the spigots themselves wear. 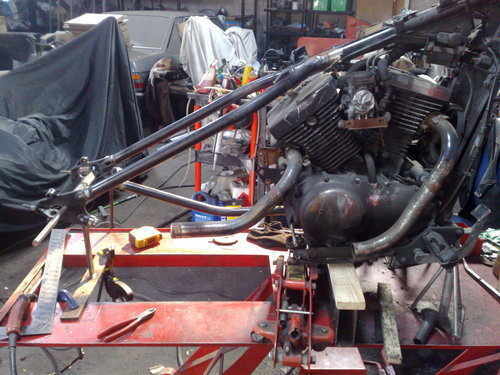 I often undertake custom frame modifications and one off custom parts as you can see in the photos below, this particular customer already had a "softail" type frame, but wasn't happy with the bulkiness of the steel pressings around the spindle area and shock absorber mount area, so he wanted me to hardtail the frame which meant removing the whole of the rear of the frame just behind the rear engine mount and remake the whole back end of it utilising as many of the standard parts as possible. I do not have any frame jigs on a purpose built bench as many frame builders do as I do not do this type of job on a full time basis, Instead I prefer to fabricate the necessary jigs to keep things in line. 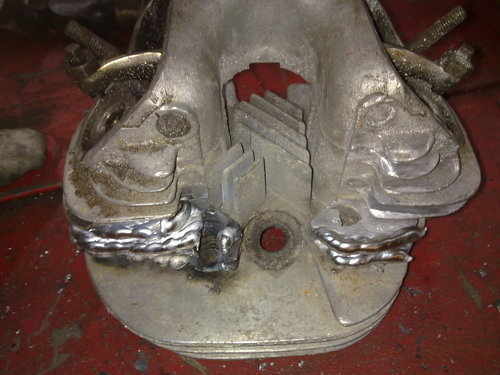 I can weld using MIG, TIG, arc and gas, depending on the application required. 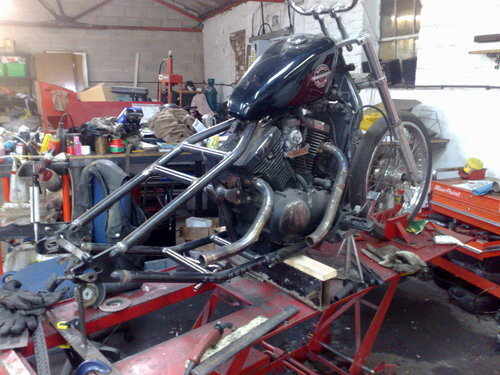 I undertake servicing on all models of motorcycles from AJS to Zundapp and everything in between. A service sheet is provided with every service telling you exactly what has been done along with recommendations for any other remedial work that I've noticed that may need attention at a later date, I always discuss these with you before proceeding. If you have your own preferences with regards to any oils or specific brake pads you want fitting I will always oblige. I have no objections if you wish to bring along all your own service items for me to fit. For valve seat grinding I use the Peg 10 model which utilises an eccentic pilot mounting ensuring the stone keeps it profile longer and therefore the seat angle is maintained throughout its grinding process meaning that it is more accurate. The other advantage in using the peg 10 is that it is more controllable than the Kwik way and Black and Decker machines in that I can control the amount of material removed by adjusting the cut on the knurled knob at the top of the machine, also it is nearly as quick to use. I used to use the Serdi Micro machine, which was an excellent machine, in that I could cut the 3 angles at once, but it was very time consuming to set up and each of the very expensive cutters was "model specific" meaning that for each model of bike I used it on, I had to buy different cutters at approximately £90 each due to the wide variations in valve the seat area between a multi valved, multi cylinder machine and a large capacity single. I find that the Peg 10 is a good compromise between accuracy and the amount of time spent setting up the machine. 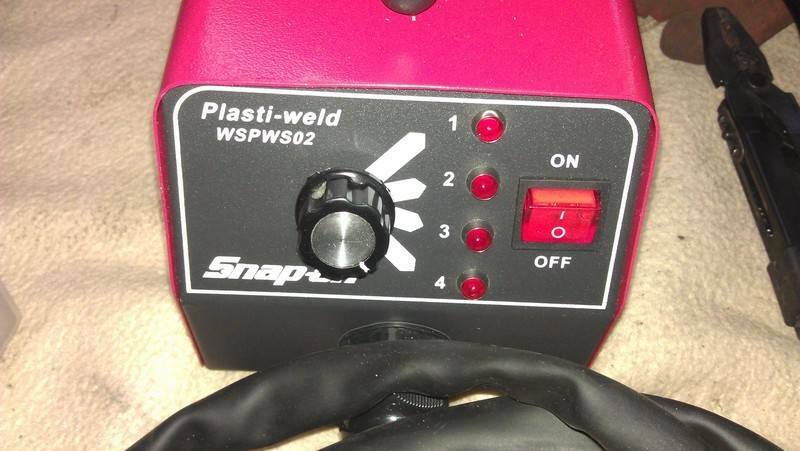 I can repair your motorcycle fairings and plastic bumpers using my Snap-On hot stapler which allows me to reinforce the repairs using a staple that is heated and sunk into the back of the plastic, after it is inserted in, it is given a slight twist which sinks the staple under the surface of the plastic, the tags that attach it to the heat gun can then be broken off. 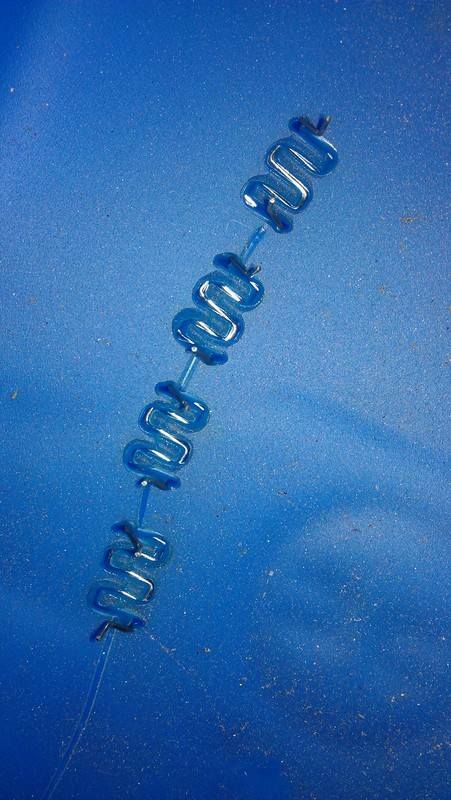 The advantage of this type of repair is that the repair dosen't just rely on the strength of the plastic but the strength of the metal staple which is shaped in a "wave" form meaning that for every staple inserted it crosses the break in the plastic multiple times meaning a stronger repair, it comes with various shaped staples to get in corners and different shapes. The repair is then smoothed over with a hot knife attachment on the back and on the front of the repair if needed. 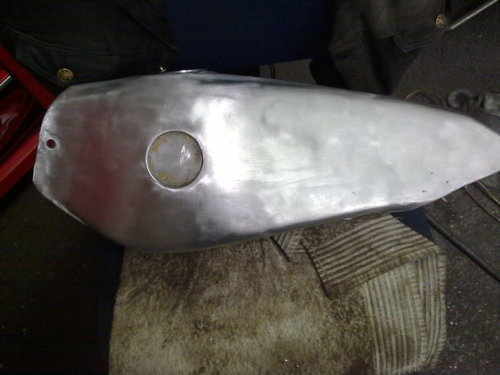 I have repaired a couple of fairings when I first got the machine and I really tried to break the repair to test it and the repair didn't give despite bending it a lot further than any bumper or fairing would in normal use. The cost of this type of repair start at £10 for smallish cracks up to about £30 for a bumper in two pieces, it is quite a cost effective way to repair plastics.The second picture is of the inserted staples which have yet to have their tangs broken off and the back smoothed off with the hot knife attachment, you can see how many times the staple crosses the break which increase the strength of the repair.